Image Entertainment, standard 1.33:1, languages: English PCM Stereo, subtitles: none, single side-single layer, chapters, rated NR, 60 min., $19.99, street date 3/21/2000. Released in March 1987, U2's The Joshua Tree quickly became the fastest-selling album in British chart history, selling almost 250,000 copies within the first week of release. In the U.S., it was equally successful, topping the Billboard album chart for nine weeks, spending 58 weeks in the Top 40 there and earning a Grammy Award for Album of the Year. The Joshua Tree gave birth to several major hit singles, including "With or Without You" and "I Still Haven't Found What I'm Looking For," both of which reached Number 1 on the Billboard Top 100 in the U.S., and "Where The Streets Have No Name." The story of the making of The Joshua Tree is told here via interview and archival film footage, with contributions from band members Bono, The Edge, Adam Clayton and Larry Mullen. U2's long-time manager Paul McGuinness reveals how the album catapulted the band into the catergory of rock superstars, and there are contributions from Elvis Costello in the role of a major U2 fan, re-mix producer Steve Lillywhite, and, of course, co-producers Brian Eno and Daniel Lanois. Here we learn the true story from Brian Eno of how the master tape for "Where the Streets Have No Name" was almost destroyed and how a forgotten birthday resulted in one of U2's best-ever songs. Packed with reminiscences and powerful performances, this is the story of one of the most famous and best records of the eighties, a true Classic Album. When U2's album The Joshua Tree hit record store shelves in March 1987, it seemed less an album release than a coronation. The buzz around this disc was incredible. U2 had built a tremendous following over the previous few years via hot live shows and some fairly successful albums, and by 1987, it seemed that their time had come; everyone sensed that TJT would be a landmark, breakout album. And that it was. TJT pushed U2 from the ranks of successful arena act to the level of stadium superstars; they immediately inherited the mantle of Biggest Act in Rock from Springsteen, a title they would maintain for a fair number of years, through at least the enormous success of 1991's Achtung Baby and the 1992-93 "Zoo TV/Zooropa" tour. It's a measure of U2's achievements that their 1997 "Popmart" tour is generally seen as a flop, even though millions of tickets were sold; the band moved about 180,000 tickets in both Chicago and New York and the tour was a bomb? Objectively, no, but in larger-than-life U2 terms, I guess so. Such is the burden supergroups have to bear. The new DVD release from the Classic Albums line shows an intermingling of the two eras as we see relatively modern-day U2 discuss their breakout release. I hadn't seen any prior Classic Albums DVDs so I wasn't quite sure what to expect. I figured we'd see various performance clips of songs from the album, and maybe some circa 1987 interview pieces, but that's not the case at all. Yes, we do witness a fair amount of video from the era. The DVD includes portions of the videos for "With or Without You", "I Still Haven't Found What I'm Looking For", and "Where the Streets Have No Name", and we also see shots from the concert film that followed the 1987 tour, 1988's Rattle and Hum. Other previously released footage surfaces in the form of clips from the 1994 concert video U2 Zoo TV - Live From Sydney (shot at a November 1993 Australian show). While those scenes are nice, more exciting are the rarer clips. We see footage from the 1986 Amnesty International tour in which U2 participated, plus other 1987 shows, some 1997 "Popmart" material, and a few other sources. I would have liked to have seen more of these instead of the Rattle and Hum and Zoo TV clips since I - and many other U2 fans - already own those programs; these other pieces are more compelling. It's also too bad that we don't see the music videos in their entirety. Happily, we do find one complete video at the end of the program. It's a 1998 clip for "The Sweetest Thing". This song originally appeared as a B-side on the "Where the Streets Have No Name" single but came out in remixed form on the 1998 The Best of 1980-1990 compilation. At that time, the band shot a new video for it, and that's what we find here. It's a very clever and entertaining clip, and I'm happy to have it. As useful as all these performance pieces were, the most compelling aspect of this Classic Albums DVD comes from the new interviews with U2 and others such as coproducers Daniel Lanois and Brian Eno. As I previously alluded, I was quite surprised to find these new (circa 1998, it appears) interviews with the band, and it's delightful to see the interest with which they discuss the album. Actually, it's not their stories that stayed with me and made this such a "must-have" for U2 fans; it's the "behind the scenes" music we hear. Many segments show participants behind mixing boards, and we get to hear isolated pieces of the songs as we learn how the tunes were crafted. At one point, the Edge even straps on his guitar to demonstrate the simplicity of his work on "With Or Without You". I recognize that if you're not a huge fan of the band, the pleasures to be found in this material may seem nonexistent. For me, though, I saw it as a really look into the creative heart of the band, and I love hearing how the different elements mesh. What I wouldn't give to have the opportunity to take music I love and create my own remixes that way! In any case, this edition of Classic Albums convinced me that the format has some value. I expected little from this DVD but found it to be a very interesting and compelling look at how U2 work (or at least how they worked in 1986-87). Classic Albums is one of those DVDs that's almost impossible to rate in regard to picture and sound because of the wide variety of sources that make up its contents. The image - which was presented entirely in a 1.33:1 ratio on this single-sided, single-layered DVD - takes new interviews, performances from 1986, 1987, 1993, and 1997, music videos from 1987 and 1998, and a few other sources, all of which vary in quality. The new interviews uniformly look very good. Sharpness seems excellent, although I noted some jagged edges and gentle moiré effects at times. Since these were shot on video, no print flaws result, and no grain can be seen. Colors are accurate and vivid, and black levels look fine. As far as the other material goes, it seems much iffier. The video for "The Sweetest Thing" looks great, but the clips from TJT tend to seem flat and fuzzy; some of that comes from the original photography - especially in the case of the "With Or Without You" piece - but not all of it. The Rattle and Hum and Zoo TV Live segments also seemed surprisingly weak in appearance, with some faded colors and a rough look. Though they don't seem terrible, I know those pieces well, and they definitely should look better than this. The remainder of the performance shots are tougher to judge because I haven't seen them. They generally stick to a level about equivalent with the Rattle and Hum and Zoo TV Live scenes, with the exception of a clip of Lanois on stage with U2 during the 1992-93 tour; it looks like it was shot with a home camcorder. Overall, the picture quality seems acceptable, though it's fairly disappointing at times. The DVD offers stereo PCM sound that also seems erratic but generally good. If anyone expects to buy this DVD and get the whole Joshua Tree album along with it, they'll be disappointed; "The Sweetest Thing" is the only song that appears in its entirety. The audio clips from the rest of the album sound clean but flat, but that's not the fault of the DVD. TJT always has appeared lackluster as a recording - it's one of the most dull-sounding recordings I know (with some songs being exceptions), and the DVD replicates the original tapes appropriately. Audio quality seems good but unexceptional throughout the rest of the program. The other music segments vary but generally seem fine, and the interviews sound good; speech appears natural and realistic. Again, it's very hard to objectively rate the audio of this DVD since it comes from so many sources, but I found it acceptable and generally good. Supplements are few on this DVD, which isn't a surprise since the program itself takes the form of something that could be called a supplement to The Joshua Tree itself. A brief and basic band history appears on the DVD, and we get a listing of their albums that also states in which years those records were released (incorrectly, in one instance: Boy came out in 1980, not 1981). 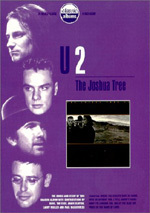 This Classic Albums DVD that documents U2's The Joshua Tree is not for everyone. Casual fans will probably find it dull, and if you don't already like U2, this DVD probably won't convert you. If you're a diehard like me, however, the program will offer a lot to interest and entertain you. Both picture and sound are inconsistent but generally good. This DVD belongs in the collection of any serious U2 fan.